#1 : Where does the basic configuration information stored ? The basic information related to the IIS Express are stored inside the project file (proj file) within the property group information section. To view it, Open the Project File in edit mode ( In this case I will strongly recomand you to use Visual Studio productivity Tool ) ; where you can edit the project file using “Power Command” as shown in the image below. Once you have the project file in edited mode, you can search for below configuration section, where you can see the application information related to IIS Express are set. You can change the configuration editable values and update the project files to take the changes effects. If your application has the SSL Enabled, IISExpressSSLPort will have the values specified for the SSL port number. #2 : Where is the configuration settings related to bindings and virtual directory? Project files have the information related to the IIS Express and it’s basic settings; whereas there are several configuration files that are required to host and run a web application. 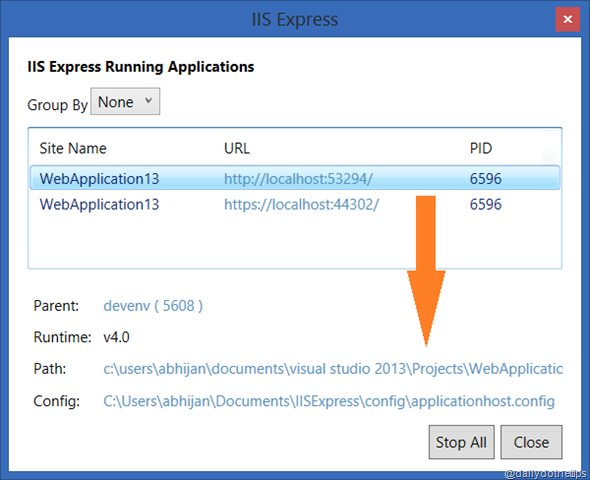 You can find all the IIS Express related files under \users\<username>\My Documents \ IISExpress\Config . As you can see this section contains the information related with the physical path of IIS Express Virtual Directory, application pool and the several bindings information. The aplicationhost.config files are user specific. You can add additional bindings within the “bindings” elements to access your sites using different urls. When you press F5 to run the project, Visual Studio automatically launches the IIS Express and it will show up in your task-bar tray while it’s running. You can right-click and select the “Application” to get the list of currently active URL’s for the current application. To navigate, you have to click on the site URL. Along with the hosting sites, IIS Express ( IISExpress.exe) is the parent process of an another application “IISExpressTray.Exe”. You can launch this application by just right click on IIS Express Icon on system tray icon and then select “Show All Applications” . 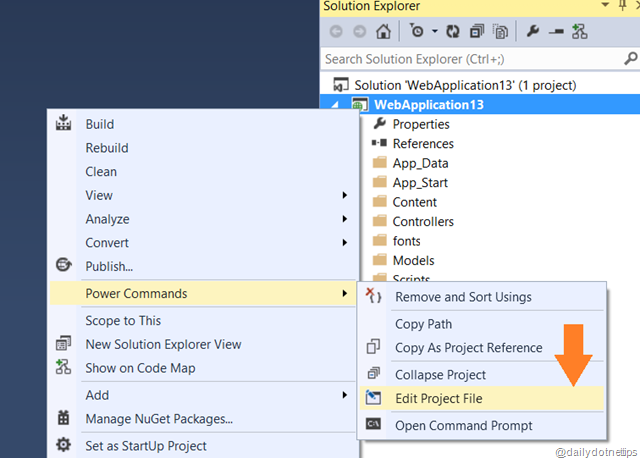 Following snaps shows the overall process hierarchy of IIS Express with in Visual Studio. From the application url lists, you can select any of the url / sites ; IISExpress tray application will show you different additional details such as runtime, application path and configuration file as shown the below image. This is the easiest option to open the application configuration file for IIS Express. That’s all ! Hope going forward this information will help you to work with IIS Express.